This morning, I watched the following video of Dr. Joseph Mercola, Interviewing J.J. Virgin about her new book. The timing was really good for me because In the last 3 weeks I’ve taken my own weight loss and fitness process to the next level. and it stunned me into getting rid of ALL grains. I still allowed a “cheat day” one day a week or so to eat whatever I wanted. I noticed that I had MUCH more energy and felt pretty darn good, but I still had some significant belly flab. Even without the grains I was not letting go of that stubborn fat. So I took the next step. As many of the leading edge weight loss and fitness researchers have advised, I began to adapt intermittent fasting to my week. A couple of nights during the week I’d just skip dinner and not eat anything until the next morning. A couple of mornings I skipped breakfast. Again, not much of a change… ini the belly fat department. I noticed that my fasting was not causing me to have any headaches or feelings of tiredness or even cravings for food. In fact the fasting felt really, really good. There was a lightness and almost feeling kind of high. It also lowered my stress level because I didn’t have to figure out what to have for dinner! It also saved me some significant money because it is usually in the evenings that I don’t feel like cooking and am more likely to go out to a restaurant. LOL! Then after a weekend away in mid October, where I felt totally bloated and uncomfortable from eating restaurant food, I decided to go to the next level. I had been eating dark chocolate, cashews and apples a couple of times a week as a snack and a treat… So I stopped. I thought that since the dark chocolate had MUCH LESS sugar in it that it would be okay to eat it. Of course I ended up eating an entire chocolate bar a day. In a similar way that I USED to eat ice cream all day. The cashews are definitely a life long addiction. I LOVE them. I have suspected for a while that they were not really working with my digestive system. So even though they are a potential source of healthy fats, I figured I could take a break for a couple weeks even from them. I figured that for 2 weeks I could just eliminate these foods and see. 2 weeks later, I’ve dropped 10 pounds and lost 4 inches around my belly. Going for 10 more pounds and 2-3 more inches gone. So I’m committing to really getting rid of every possible kind of sugar until my body is firmly and solidly burning fat. I WANT to see my abs! I also want to take healing my gut to the next level. So I have upped the amount of fermented foods I’m eating. 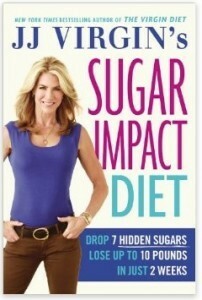 Coincidentally I saw this interview by Dr. Joseph Mercola with Best selling author J.J. Virgin about her new book “The Sugar Impact Diet” and it was uncanny how everything she said made sense. AND I had quite literally just done what she proposes, I quit all sugar for 2 weeks. I lost 10 pounds and 4 inches around my middle. So I wanted to pass this along to you as soon as possible. So here’s the video and all the thoughts it triggered for me are below. Use the handy form at the bottom of this page if you have any questions or thoughts you’d like to share with me! Use the Handy Opt-in Form if you would like to be the first to get new articles and announcements from me. One of the main “take-aways” from this interview is that there is a ton of mis-information floating around out there. Here are just a few off the top of my head. Eating frequent snacks. The truth? if you are burning sugar instead of fat you will crash and burn without frequent “top-ups”. But when you have successfully switched to fat burning mode, you can easily go many hours between meals without feeling tired or depleted. Fruit is healthy. I have a friend who is a diabetic. He eats a ton of fruit. Why Because he thinks its “healthy”. He’s also a vegetarian and doesn’t “get” that rice and beans and “whole grains” are also experienced as sugar by our bodies. The first law of thermodynamics. Calories in Calories out. It’s as simple as reduce the amount of calories you take in and increase the amount of calories you expend and you will lose weight and inches…. FALSE! It’s an over simplification and it will get you in trouble. the hormones triggered by the kinds of foods you eat either support fat storage or fat burning. If you go on a starvation reduced calorie diet you will trigger a whole host of unwanted processes, you body will think there is a famine and so start to get more and more efficient at NOT using up your fat supplies. You ghet sad and depressed as you struggle to not eat foods you are craving. DEPRIVATION sets in… and eventually you give up and BINGE. Whole grains are “healthy”. Read Wheat Belly and Grain Brain if you want the facts. The bottom line is that Wheat is one of the food highest on the glycemic index. Your body experiences it as sugar. “Alternative” sweeteners like Agave are “better” than regular sugar. Come on! It’s still sugar. Just because the “Agave Industry” wants to sell more of it doesn’t mean you should eat more of it. Gluten Free or vegan desserts are better for you than regular desserts. Maybe. But THEY ARE STILL FILLED WITH SUGAR! Every single vegan I’ve ever met was totally addicted to carbs… and carbs are …. sugar! Wheat is SUGAR. Corn is Sugar, quinoa is sugar! It’s better to drink diet soda than regular soda. NOT! Some of the sugar substitutes are 100’s of times sweeter than regular cane sugar and what that does is cause you to become accustomed to sweeter and sweeter tastes. Chemical sweeteners are basically poison and contain excite toxins. If you had a choice between something sweetened with chemicals or something sweetened with actual cane sugar, you would be better off with the natural sweetener. HOWEVER! It’s better to drink Juice than soda. NOT. Fruit juice is simply concentrated SUGAR. ALL soda and fruit juices should be on your DO NOT TOUCH list. Fat will make you fat. False. There are books and books written about this but sadly few of my weight loss clients have heard of them much less read them. You are “stuck” with your genetic predisposition, Your “family” body. Totally false. You may be stuck with your basic body structure like whether you are big boned or small boned, endomorph or ectomorph, tall or short, but what you put into your body and what you do with your body and what kinds of thoughts you think are totally and completely determined by YOU. Where your family of origin factors in is mostly the beliefs about your body and about what foods are good for you and about the quantity of food you need to be “healthy” etc. Marathon runners are healthy. Other than wearing out their bodies with hundreds of miles of high impact stresses, and wearing out your body with over training, Marathon runners and long distance cyclists as a group are totally convinced they have to load up with carbs in order to fuel themselves. If you love to run, go ahead and do it. But if you are running to be fit and want to stay fit for life and avoid injuries that cause you to stop moving, then you will want to explore other options that take less time and are safer. Eating energy bars and meal replacement shakes sweetened with fructose is healthy. Sorry Isagenix and Herbal Life. Your meal replacement shakes are filled with fructose. NO THANK YOU. Yogurt with fruit in it is a healthy food choice… maybe in extreme moderation AFTER you’ve switched to fat burning mode. But the fruit will also make you bloated and gassy. And Fruit is… SUGAR. The healthy bacteria in the yogurt IS good for you. But somehow you’re going to have to find a way to either eat full fat organic yogurt without sugar, or get your healthy probiotics with fermented vegetables or in a supplement. SUGAR feeds the bad bacteria in your gut and causes you to store fat as well as to crave more sugar! Gluten, dairy and sugar are ADDICTIVE…. pharmacologically and biologically they act like DRUGS. These substances shake hands with the opium receptors in your brain… WE are hardwired as animals to seek pleasure. Sweetness in nature is rare. But in the last 100 years we as a species have had more access to sugar in all it’s forms than any people in history. It is wreaking havoc with our health. There are always ways to improve. I hope you take the time to consider that your body is a vehicle for you to enjoy and interact with the world of sights, sounds, feelings, tastes, textures, scents and awareness. If you don’t take care of your body where will you live? Watch the video, educate yourself, begin to experiment with a long-term strategy for gradual, steady, optimal health and wellness, well being, happiness, self love and fitness.